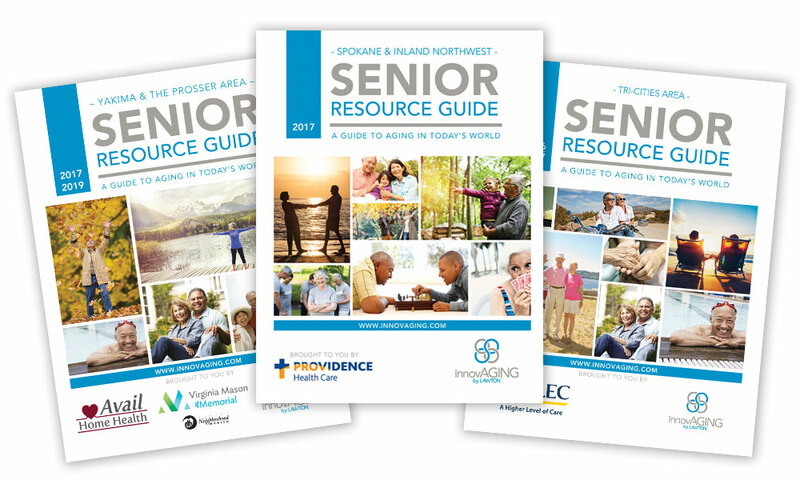 Whether you are anticipating the future or coping with a crisis now, InnovAGING’s Senior Resource Guides can help you discover the help you need to take responsibility for challenges you might encounter as a senior, or as someone who is caring for an older person. Our guides are a way for families to discover topics about which they can create meaningful dialogue. Getting older is a process in which every living person is engaged–it is a family and community matter–between spouses, partners, siblings, and the generations. We currently have guides for the Spokane, Tri-Cities, and Yakima areas in Washington State. Each of our guides has five information-filled chapters so you can find the resource you need. Information for planning ahead, managing your financial, legal, and final planning and safety and security needs for the future. Descriptions of housing alternatives, guidelines for choosing housing, and a comprehensive list of choices that span the housing continuum for seniors. Details health care and support services and programs including hospitals, medical resources, food and nutrition, outreach, support groups, transportation and more. Health index of illnesses and ailments combined with a listing of organizations and resources to offer assistance. Local, regional and national opportunities for seniors in educational, recreational, familial, cultural, high tech, and volunteer forums for life-expanding experiences. You may not control all the events that happen to you, but you decide not to be reduced by them. The sun at home warms better than the sun elsewhere. © 2017 InnovAGING | All Rights Reserved | Powered by Lawton Printing, Inc.